Set the stopwatch for 15 minutes and do nothing but work. As soon as that annoying sound goes off, set the stopwatch again for 5 minutes and do anything that you want to do that doesn't involve doing the work that you actually suppose to be doing. 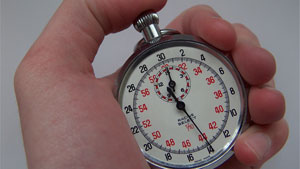 As soon as the stopwatch goes off set it again, this time for 35 minutes of work and 10 minutes of doing whatever you want. Keep going and increase the time five minutes each time. Before you know it, you’ve actually completed your work! Simple! Side note: I actually wrote this blog when I was on my 10 minutes of "do anything" time. Great ideas always come to mind when you have other things that are more urgent to do. I think it's important to be open to it and accept who you are instead of trying to change yourself. Just work with it and make it work for you. If you decide to implement this strategy, I would love to hear how it worked for you. What strategies have you tried that work at beating procrastination?